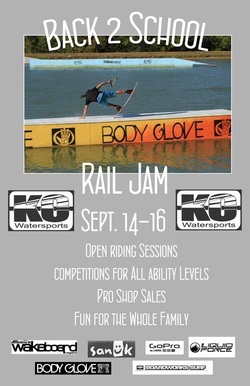 There will be 4 divisions to compete in, beginner, intermediate and advanced wakeboarding, followed by the wakeskate division. This will be a features only competition. The beginner division will be allowed to spin up to 360 degrees, the Intermediate division will be allowed to spin up to 540 degrees, and the advanced has not limitations. Each rider will be allowed 2 complete laps and will have 2 chances to complete their best run. The best of the 2 runs will be used for their score. Prizes will be awarded for the top 3 finishers in each division. The competition will start at 3pm on Saturday, August 24th. Entry fee for the competition will be $20. We will also offer a 3-day pass good for September 14th-16th for a fee of $65. The $65 fee also includes the entry fee into the competition. This will give each rider a chance to come out and fine tune their skills for the competition. Open riding will be from 2pm-7pm on Friday 23rd, 12am-3pm on Saturday the 24th, and upon completion of the competition until 7pm. It continues on Sunday the 25th from Noon-6pm .If there are any questions please feel free to give us a call or shoot us an email.